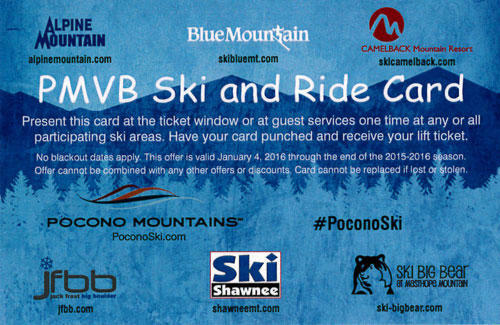 The Pocono Card returns for the 2017 ski & ride season. These cards are very popular and will SELL OUT QUICKLY. Your best bet to secure your card(s) is to logon around 12:01am and complete your purchase. We are providing our own belayers!!! It’s that wonderful time of year again, crisp mornings, clear blue skies, and beautiful colors across the mountains. These are the perfect days for weekend hikes and bike rides and just getting out with friends. Plus it’s time to get ready for the start of another ski season. Of course our club has been busy with all of the above! The past few months have been great with all the things we’ve had on our social calendar and the bi-weekly meetings have been a lot of fun visiting with so many friends. I’m amazed to think that I’m almost halfway through my term as president, but I have to say it was been very rewarding so far and I think the best is yet to come! We are back to our every week meetings now with membership renewal period. This time of year is always exciting as the meetings get even busier than they already have been. I really enjoy seeing different friends as their schedules fall into place for them to be able to get out on a Wednesday night. The influx of new memberships spurred by the start of another ski season brings some extra excitement to the meetings too. I really like to take a moment to look around the room after the business part of the meeting is done and see so many friends, old and new sharing stories and making plans for future adventures together and of course that will lead to even more great stories! See ya all soon at a meeting, on the slopes, or on the trail! Welcome Back Craigmeur members – the leaf colors are peaking in Vermont, get up there to enjoy the brilliance of the autumnal color changes. I am looking for one or two members to alternate as apprentices with me as NJSSC rep. Being a NJSSC rep entails attending the NJSSC monthly meeting (2nd Monday Sept thru May), learning the voucher order / distribution system and posting info about NJSSC events & offers on the Craigmeur web site as info becomes available. Interested members please contact via email – skijcb (at) hotmail.com. Thanks ! NJSSC Guidebook printing will be completed in October and you can get your NJSSC Guidebook copy at the NJSSC Expo (Jamboree), Friday 28 October 2016 at The Hanover Marriott. I will bring copies of the guidebook to regular club meetings beginning in November 2016. NJSSC Discount Vouchers will be available thru the NJSSC club rep at any Craigmeur meeting. Resort voucher pricing contracts have NOT been finalized, therefore initial delivery will occur in December 2016. VOUCHER PURCHASE POLICY – if your payment has not been received the night of the cut off, your voucher order WILL NOT be submitted for purchase. No late payments will be accepted this season, NO EXCEPTIONS. Voucher orders can ONLY be picked up at regular club meetings. Please plan accordingly. A determination will be made in February 2017 whether additional vouchers will be available beyond the last delivery date. Resort discount offers, weather and member participation will be determining factors.